to recreate many of the projects in this episode. And I issued a challenge to all of you in today's episode, scroll down to find out more! 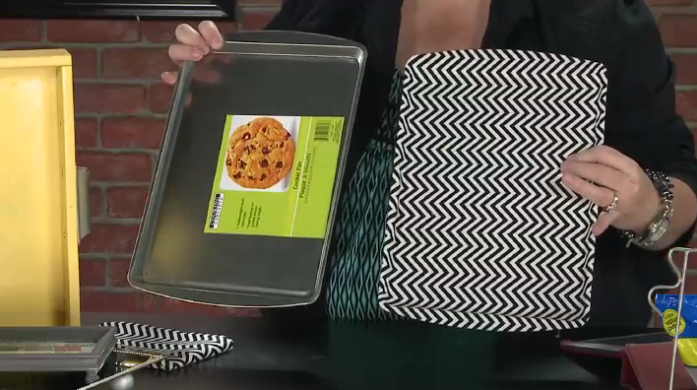 surfaces so they are food safe. It's a clear varnish, epoxy coating or shellac spray. Add chalkboard vinyl or chalk paint to the center of the trays. 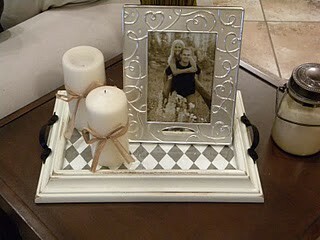 My Favorite Tray to date...a picture frame tray!! Add scrapbook paper or subway art printouts to photo frame. 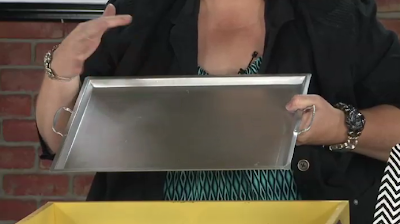 I am asking you my viewers and readers to share your ideas for what I could do to finish this yellow "drawer" tray and silver metal antique store find tray. Anything goes...leave a comment and share what you think would look best. I'll take the best ideas, finish the trays and share. 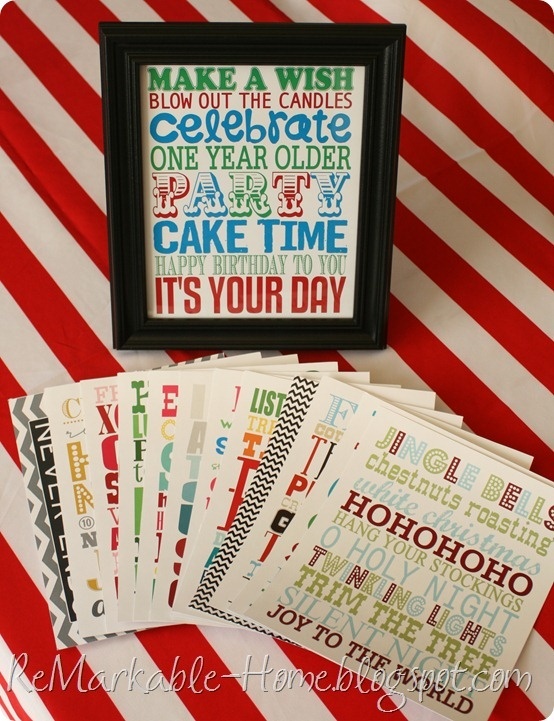 The lucky winner(s) will receive a box for of vinyl and chalkboard vinyl from Brookie Craft ($30 value)!! All ideas must be submitted before June 7th. 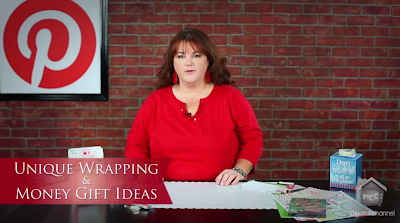 new ways to cover and decorate notebooks for a fun and inexpensive gift! 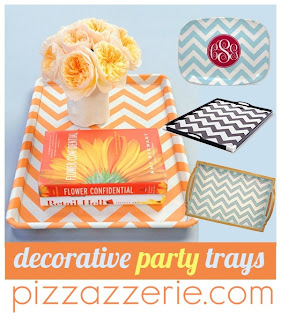 Lori- I think a really cool monogram (in vinyl of course) would look great on that silver tray and I think you should cover the yellow tray with fabric. Maybe a nice large floral. Love your show- keep pinning! 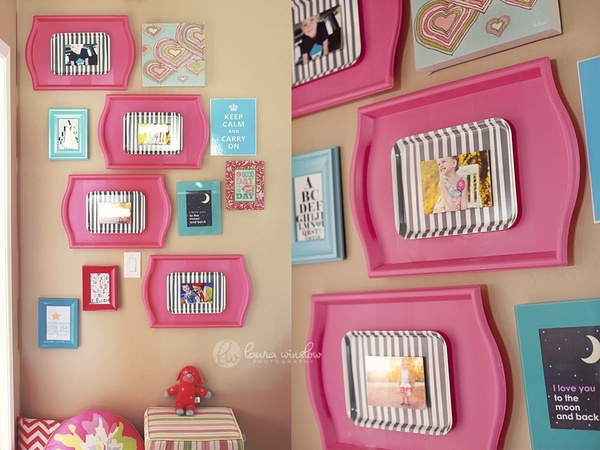 I saw on pinterest where someone had written all the things she was grateful for and put it in a picture frame. put glass over top and the vinyl word grateful. Really a cute idea. You can take this a step futher. With all the peoples name in your family. ( with the word family on top. summer activities, with the word summer or vacation. Oh, I have to try this, thanks for all the ideas. Lori - LOVE all of your Pinterest shows and ideas. I would decoupage the yellow tray (to your heart's desire) and would try mirror spray paint or mirror vinyl on the silver tray. I just completed a tray on my blog with my grandchildrens pictures at http://happyscrapperdiane.blogspot.com for cute idea. Love watching your ideas! vinyl doily and cover with glass. I think some word art in the hello tray - either one large word or a collage of words or names of family members or close friends. Use it at your next party. Or... how about decorating it with lemons and use it as a lemonade tray? Summer is coming and lemonade is very refreshing. You can use some vintage lemon artwork (and old CountryTime label maybe). How about using the silver tray for jewelry? 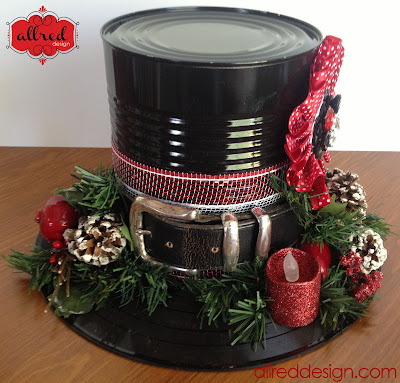 You can decorate the edges with vintage costume jewelry and maybe place a mirror in the center. You can use vintage (mismatched) earrings along the bottom edge (as hooks) and hang necklaces from from them. It would look great hanging on a bedroom wall. I'm really going to go way off the tray with this one. Since the tray is yellowish gold. 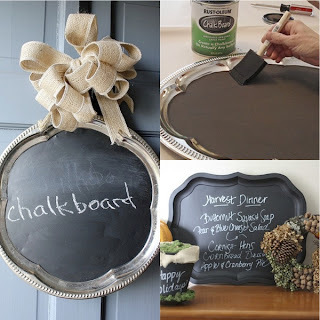 I would mod podge it with some newspaper articles from when my husband & son went to the Super Bowl and the Steelers won. Since they are gold and black. However, you may not be a football nut like me, what about just some great newspaper or magazine articles that you have saved about you and or someone in your family. Love these ideas and love you! 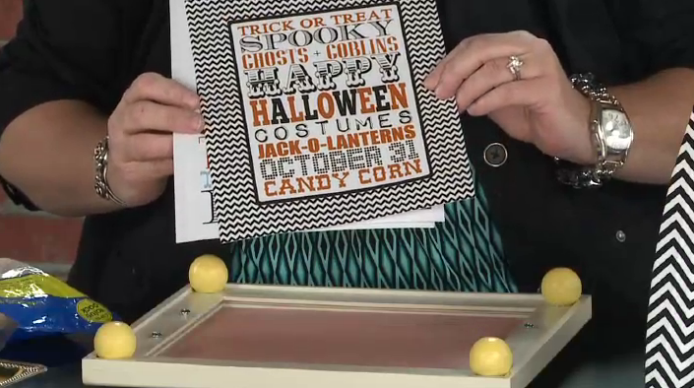 For the yellow tray I would get paper doilies and spray a different color paint over them and then remove the doilies. Then I would put a monogram or a word in the center. For the silver tray, I would do black & white photos and get some kind of vintage type - typewriter keys, scrabble letters etc. to put a title or word on it. Love all of the Idea's you have shown us! 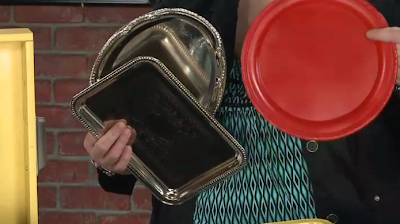 The Silver Tray may be pretty hanging on a Wall with several Hooks on it, to hang someone's Jewelry and the back of it could be Monogrammed in Vinyl with the Woman's Name or Initials. 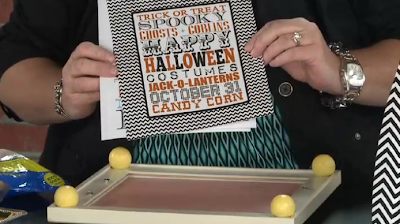 The Yellow Tray would be so Cute hanging on a Wall or sitting up on it's side with Chicken Wire in it to clip little Notes or Pictures. Have you ever used liquid starch? I think that it would be darling to find some fabric that you love, dip it into the starch and then smooth it on the tray. When you are sick of it, pull if off and put something else on. I love liquid starch and all of the fun things that you can do with it. Plus-it's cheap, cheap, cheap! 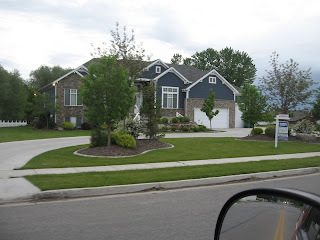 Here is a link to my blog, so you can see what I am talking about. Happy creating my friend!!! On the silver tray-a lace doily cut from white vinyl, possibly smaller ones in the corners depending on the size of the first one. 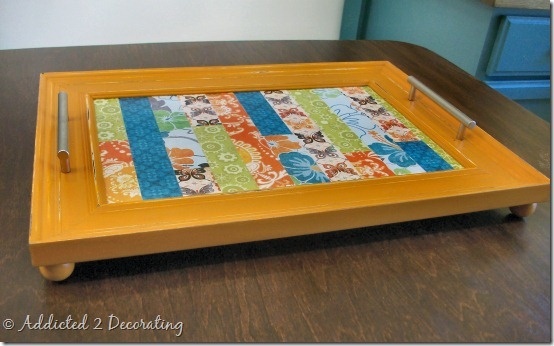 On yellow tray- decoupage flowers from wrapping paper or scrapbook paper and cover with either glass or clear varnish. Lori when I up cycled my antique drawers I used gift wrap for the inside of them, gift wrap! Was budget friendly and super easy. I think gift wrap inside your yellow tray, that's my vote! I'm saving up bottle caps to spray paint a few different colors and place in the bottom of the trap. 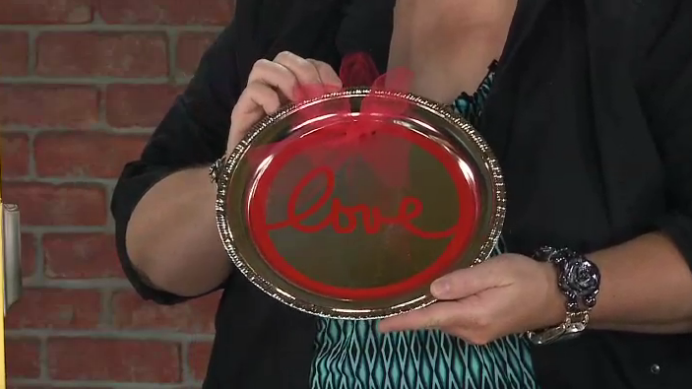 I saw it on this website http://sweetsomethingdesign.blogspot.com/2010/07/bottle-cap-tray.html and she used acrylic water to fill in the gaps and seal everything. The yellow drawer would make a great shadowbox! I'm new to your blog and the show and absolutely love your ideas! 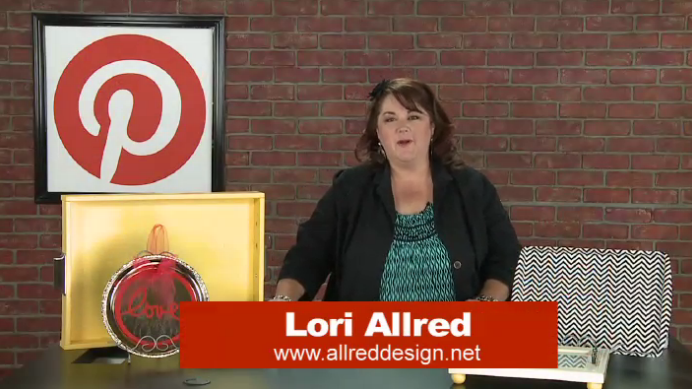 Hi Lori, love your episodes. For the yellow tray, I think it would look cool to do family photographs, for the silver tray, I think that would look great either in the bathroom for toiletries or in the bedroom for perfumes and such. 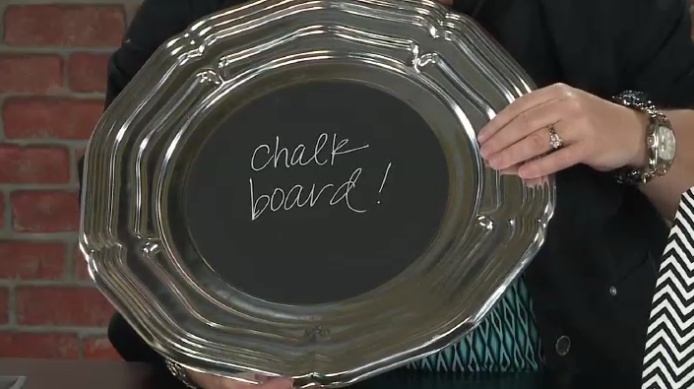 Lori, don't count this comment, as I already commented earlier but another idea came to me, that silver tray might even look great in the kitchen covered with chalk board vinyl to use as a grocery list. I think cutting a piece of burlap to fit the bottom would give it a really cool texture. 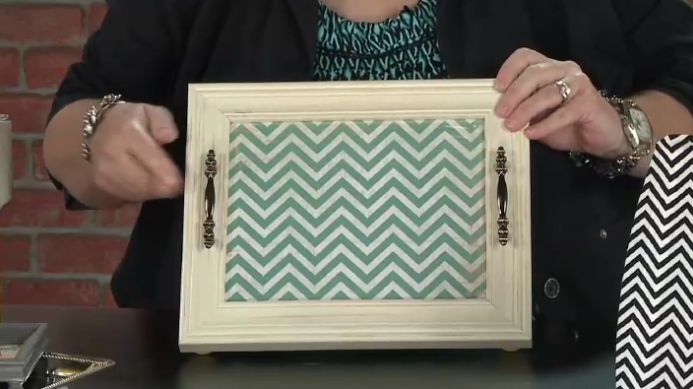 You could then have a piece of glass cut to fit over the burlap and secure it with E6000 to use as a tray on a coffee table or you could just leave the burlap plain. Anyway, great episode. I would make a shadow box of sorts. You can glue in whatever elements you were wanting. An example is a design using the toilet paper rolls. You have it contained/framed within the tray. You could also do momentos from a vacation or shorts event, or whatever. 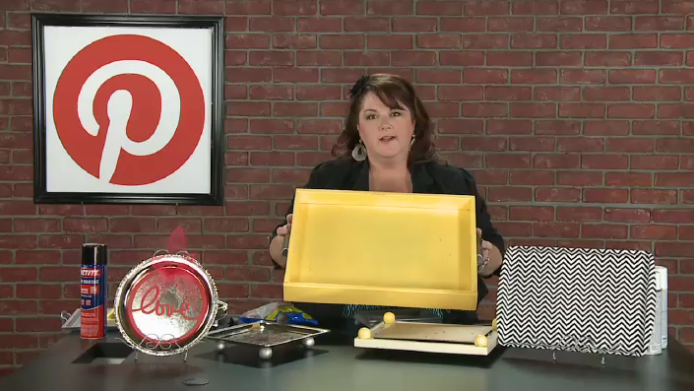 Catching up on some episodes I missed and wanted to give my take on your yellow drawer/tray. I would cover the bottom with navy/white stripe fabric and use it as a table tray - adding a few matching objects (large clear martini glass with twine balls, white ceramic starfish, trinket box). When I first saw it on your show today, it screamed 'nautical' to me picturing it with navy and white. It is big enough to hold many items. Love it! I would turn the metal tray into a calender. I would put patterned paper on the inside (for the background), get a sheet of magnet material and cut out the months with a cricut or other cutting machine, cut 35 mini squares with patterned paper,cut (S M T W TH F S) and cut the numbers 1-31 out in vinyl. I would spray paint bottle caps, let them dry, put the numbers on front of them & glue magnets to the back of them. Lastly, I would glue the days of the week, glue the squares & put the magnets on top of them, and put the corresponding month on top. The yellow tray would make a cool lego tray. 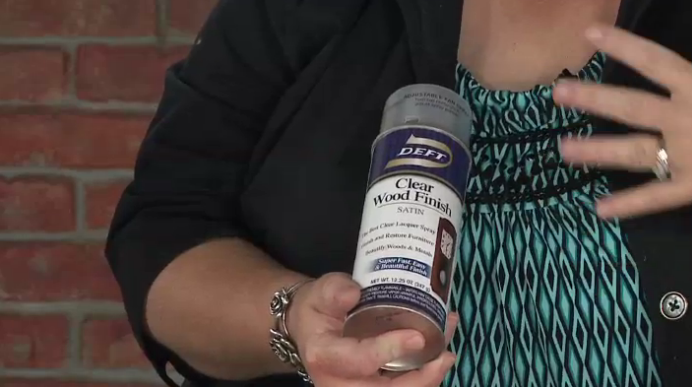 Use your super strong adhesive to apply the flat logo boards to the bottom.